3 Branch Models. $7.5 Million In Savings. 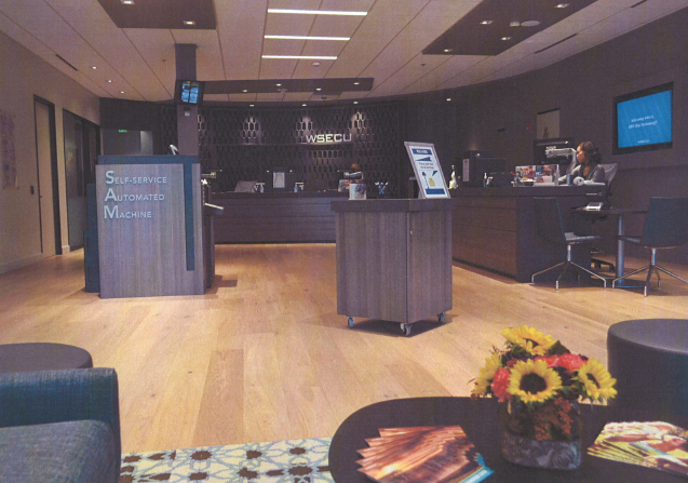 How a shift to universal tellers and a rework of its branches saved WSECU millions. In 2013, WSECU implemented universal tellers and changed its branching model. Since then, the credit union has saved $7.5 million in staffing costs. 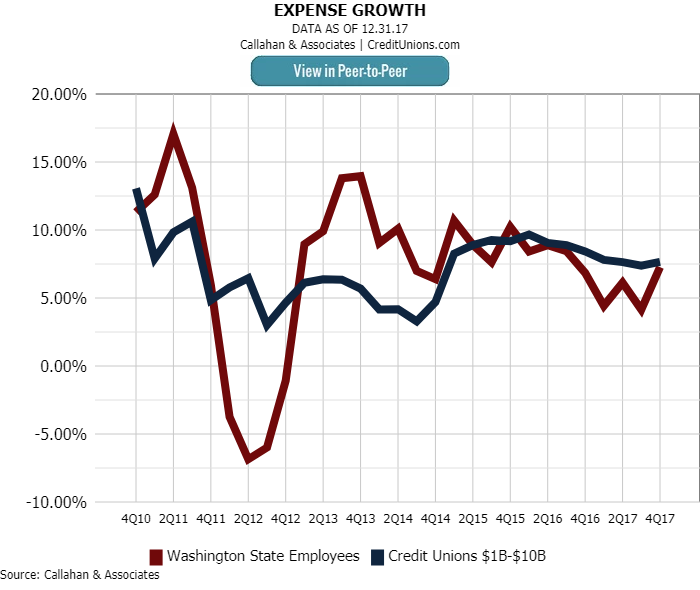 In early 2013, Washington State Employees Credit Union ($2.8B, Olympia, WA) was fighting a battle on two fronts: operating expenses were growing and income was falling. Specifically, the credit union looked at its branching model. It hired a third-party consultant to identify opportunities in staffing and made the decision to migrate to a universal teller model. To accommodate the staffing shift, WSECU had to rethink its physical presence as well and has introduced three branching concepts across its northwestern Washington market. 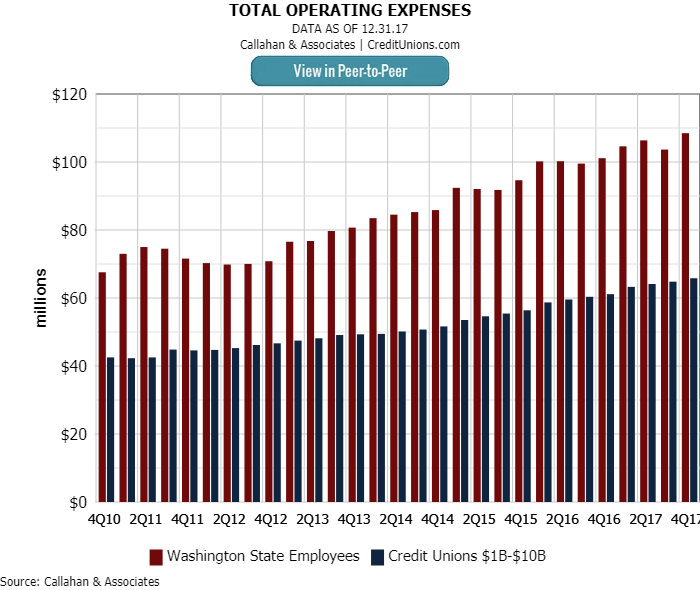 At the start of 2013, WSECU’s total income dipped slightly as the institution incurred higher costs of business. While income dipped, total operating expenses rose by more than $10 million across 2013. 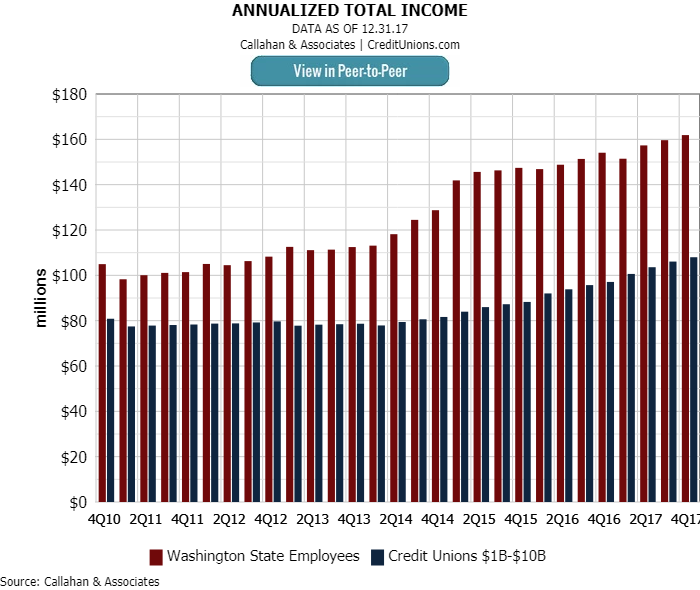 Income growth fell at WSECU starting in 2013, but its asset-based peers noted a steady climb. Compared to asset-based peers, WSECU’s expense growth across 2013 and 2014 far outpaced similarly sized institutions. 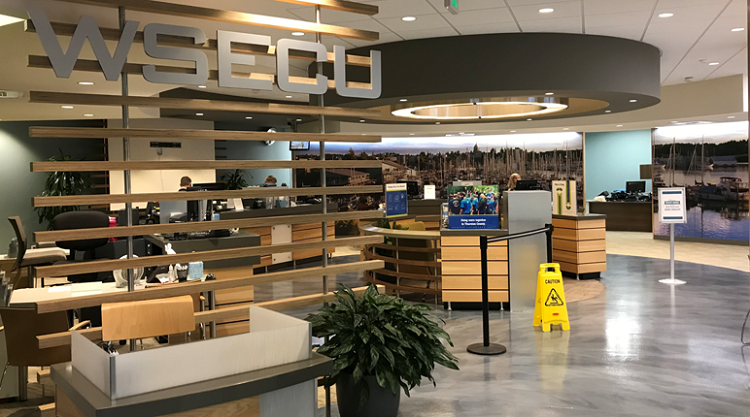 In 2013, WSECU opened the first version of its new branch concept at its Town Center location in Tumwater, WA, a branch that handled approximately 6,000 transactions per month. The credit union designed this pod-based branch in a circular pattern. In-branch traffic flows clockwise around a central waiting area to available universal tellers. The branch also offers office space for managers to work or universal employees to engage members in lengthier conversations on investments or real estate. The credit union soon discovered people don’t always go where they are supposed to. According to King, members have the tendency to back up at the first pod station. Or, failing that, simply approach universal tellers from a counterclockwise direction, thereby skipping in front of members queued correctly in line. WSECU had planned to use this model for two additional branches but shuttered those plans once it saw the model wasn’t working as designed. The circular design of WSECU’s 1.0 model at its Town Center location had its design challenges. The space didn’t echo member needs or behaviors, according to King. The design was aesthetic but not functional — a theory put into practice before it had been adequately tested. WSECU’s West Olympia branch, in Olympia, WA, handles north of 7,000 transactions per month, according to King, and is one of two examples of the credit union’s 2.0 model. The design at West Olympia offers an open flow. Pods are set-up in a horseshoe, and universal tellers can acknowledge members as they enter the branch and call them forward when it’s their turn. But here, again, queuing is an issue. Where to go or how to wait is not intuitive for members facing this concept for the first time. WSECU added signage to better communicate how the concept works and now has an employee who signs members in and sets wait-time expectations. The horseshoe design of WSECU’s 2.0 mode at its West Olympia location remains the flagship model, although signage and attentive tellers prove important to the member experience. Kris King, vice president of retail operations at WSECU, has helped the Washington cooperative transition through three branching designs until it found the right fit. Here, he offers advice on how to stay the course and never lose hope. 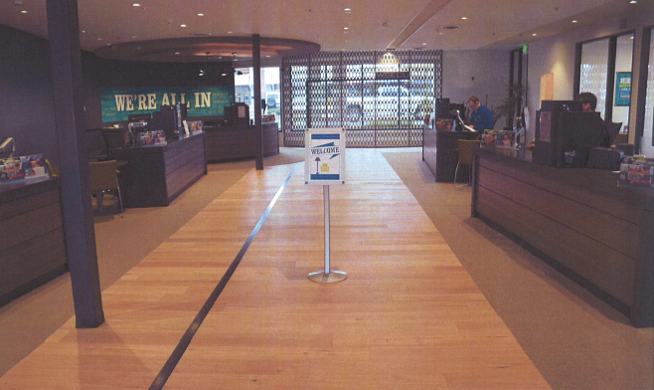 As first constructed, the West Olympia branch housed a technology bar near the front door for tellers to migrate member conversations from the pods to the bar and show them how to use the credit union’s technology offerings. Soon after, however, the credit union removed the technology bar from the space. “It was the most underutilized space in the branch,” King says. That’s because it’s easier for tellers to have conversations with members about technology where they are already standing — at the pods. 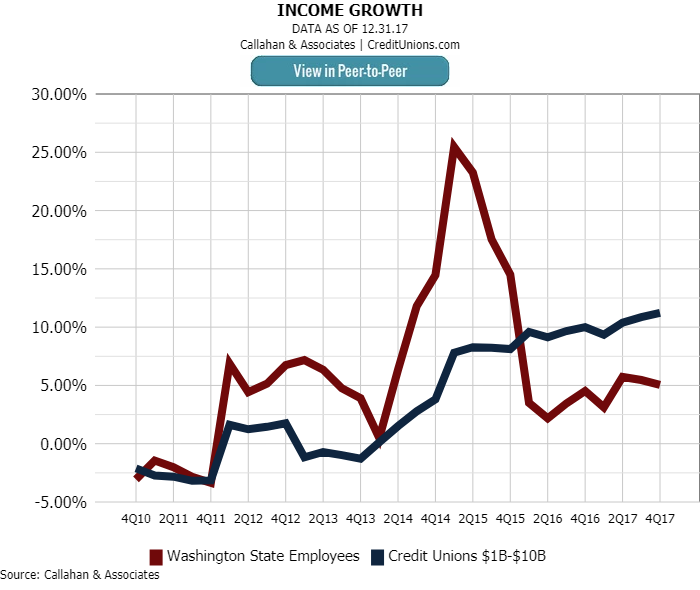 The West Olympia branch has become the credit union’s flagship model for new spaces; however, it requires a certain footprint and transaction volume to pull off. But efficiency, in the form of reduced headcount and square footage, was a driving factor behind WSECU’s branch transformation. So, the Evergreen State credit union looked for ways it could update smaller, neighborhood branches using a concept similar to West Olympia. Enter Puyallup, WA. The credit union’s branch here handles 2,000 to 2,500 transactions per month with 3.5 full-time equivalents, King says. The strip mall location features three pods and an in-lobby teller machine, which the credit union calls “SAM,” for self-service automated machine. SAM is video-capable, but WSECU hasn’t yet experimented with that function. “Because of the number of people who work at this branch compared to transaction volumes, it gets extremely high member service ratings,” King says. Located in a strip mall, WSECU’s 3.0 model as shown in its Puyallup location includes three pods, an in-lobby teller machine, and 3.5 FTEs. Overall, King says the credit union’s branching and staffing change-up has proven successful, especially as it relates to efficiency gains. In 2013, the shift to universal tellers allowed the credit union to reduce branch FTEs by 16, a benefit of $886,000 for that year. In 2014, WSECU reduced staff by eight; in 2015, by five. Part of what has allowed this to occur is the credit union’s “robust” floater pool of eight part-time universal employees. All told, however, the credit union is saving more than $1.9 million per year — or $7.5 million total between 2013 and today. “And that’s the punchline,” King says.